What could be the repercussions of an all-out trade war? The combination of trade war and currency war led to a fall in purchasing power across the developed world and eventually resulted in the Great Depression of the 1930. The last time the world saw a trade war was in the 1930s when every nation was trying to promote domestic industries by imposing tariffs on imports. As it became increasingly difficult to find export markets, countries started to drop the value of their currencies and the trade war soon degenerated into a currency war. The combination of trade war and currency war led to a fall in purchasing power across the developed world and eventually resulted in the Great Depression of the 1930. But why are we talking about trade wars now? In March, when the US announced the imposition of 25% import tariffs on steel and 10% on aluminium, it was always clear that the target of these tariffs was China. 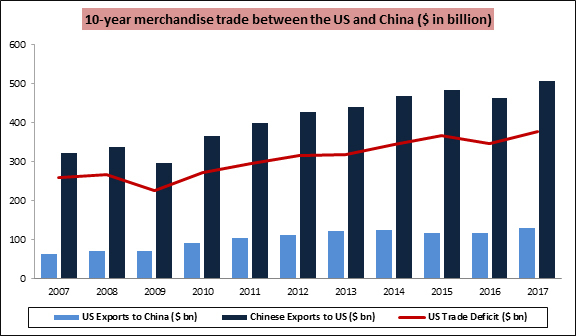 After all, the US was running a $375 billion annual trade deficit with China (see graph above) and that was something US President Donald Trump always had his eyes on. He had come to power promising to cut down the huge trade deficit that the US ran with China, rest of Asia, Canada and Mexico. In case of China, Trump actually went a step further. He announced tariffs specifically targeted at China and these were intended to impact nearly $34 billion worth of imports from China (these tariffs have been effective from July 6). Now, Trump wants to expand the tariff coverage to $200 billion of imports by September 2018 and to the full $550 billion of imports by December 2018. Trump has given two justifications for these tariffs. Firstly, Trump has targeted China because they are able to produce goods at artificially low prices because of the specific government subsidy provided to manufacturers. Secondly, Trump has also accused China of stealing US intellectual property in the name of outsourcing. So, what will be the outcome? The US has already confirmed that Canada and Mexico will be exempt from tariffs if they agree to a revised NAFTA agreement that is more favourable to the US. China, in turn, announced a set of retaliatory tariffs on US imports ranging from beef, soybeans, pork, apparel and cars. In fact, China has identified 106 US products and imposed tariffs on US imports to the tune of an equivalent $50 billion. Now even EU is planning to target US imports to the tune of $20 billion. Assuming that a full-fledged trade war does break out, what could be the repercussions? Repercussion 1: China will try to hit the core voter constituency of Donald Trump, which is the US farmer. The US currently exports nearly 30 million tonnes of soybeans to China each year with a total value of $10 billion. China has already targeted soybean imports as US farmers get an unfair advantage in the form of subsidies from the government. China is already the largest soybean consuming market in the world and could shift its imports to Brazil. That will hit the US farmer where it hurts them the most. Trump may choose to directly fund the farmers which he has already started with his $121 billion package. Repercussion 2: China’s counter tariffs could have a major impact on jobs in the US as there are many industries that are predominantly dependent on China. For example, 50% of Boeing’s exports go to China and Chinese aircraft demand supports nearly 1.50 lakh jobs in the US. China could shift more of its incremental orders to Airbus. China is the largest market for Apple phones and the iPhone is almost predominantly manufactured in China. That could be a big hit for the world’s most valuable company. Lastly, if General Motors was saved from bankruptcy post 2009, then it is thanks to China. GM sold 4.5 million cars in China last year and it has been their biggest market for the last 6 years. One can imagine the impact on job creation in the US if China goes all out to retaliate. Repercussion 3: The Chinese Yuan has limits on volatility since it is now part of the IMF SDR. But if push comes to shove, the Chinese central bank couldn’t care less. Remember, China is the world’s largest importer of every conceivable product, including ores, steel, aluminium, aircraft, consumer goods, food products etc. If China drops the yuan, then most of the countries that export to China (from Brazil to Australia) will have to drop their currency in tandem to stay competitive. We saw that briefly play out in 2015 when the yuan dropped and the INR also dropped in tandem. So a yuan weakening by China could actually trigger off a mini-currency war across the world. Repercussion 4: China does have another trump card, which it could use under extreme circumstances. China has the world’s largest chest of forex reserves to the tune of nearly $3.60 trillion. Of this, nearly $1.25 trillion is held in US treasuries, the single largest holding. If China even indicates that it plans to exit its holdings in US treasuries, the impact on global currencies and financial markets could be very deep. Of course, one hopes that the trade war threats will eventually fizzle out. At the end of the day, few countries will be spared the repercussions of an all-out trade war. At least the world’s largest exporters like China and Germany will surely be worried.